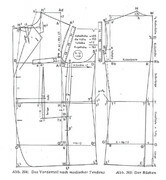 Halsspiegel = neck mirror = the neck measurement (which is mirrored to the other side). I have left the initials for the specific measurements as the German ones and given their English meanings. This is because I have not altered the diagram to be English (sorry - too much work).